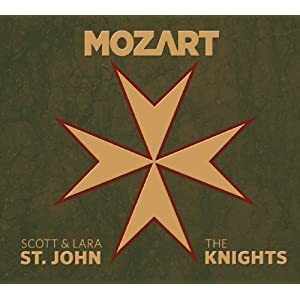 n October 12th, Ancalagon Records presents a new Mozart recording featuring violinists Lara and Scott St. John to be released on SACD/CD Hybrid. The siblings St. John share the spotlight in three of the composer’s violin concerti recorded on Lara’s Ancalagon label. The focal point of the album is Mozart’s monumental Sinfonia Concertante (K. 364), the last and greatest of his string concerti. This piece is rarely recorded in its original form, with the viola part in scordatura (with open strings tuned a semi-tone higher than standard tuning). Scott St. John takes up the viola to join his sister on the recording, making this the first time the Sinfonia Concertante has ever been recorded by siblings. The remainder of the album lets each St. John take center stage. The Violin Concerto No. 1 (K. 207) is led by Scott, and Lara has the solo voice in the Violin Concerto No. 3 (K. 216). The innovative New York-based ensemble The Knights collaborate with the pair on all the works (also led by the sibling act of conductor Eric Jacobsen and concertmaster Colin Jacobsen). The internationally acknowledged sound recording legend Tonmeister Martha de Francisco is recording producer. Having produced or engineered over 300 recordings, de Francisco has been entrusted with the recording legacy of world-class soloists and orchestras from Alfred Brendel to the Philadelphia Orchestra. On August 3rd the album was made available in pre-release exclusively on the iTunes Music Store where it reached the top of the classical charts. The album has met with enthusiastic early critical acclaim from publications including the Toronto Star who gave the recording Four out of Four Stars. Strings magazine proclaimed it "a match made in heaven,” and called the recording “flawless,” while The Classical Review wrote "This is consistently stylish and individual Mozart playing from the engaging St. John siblings." All About Jazz raved “Mozart's Sinfonia Concertante has enjoyed many inspired pairings, but none sharing the passion, empathy and genetics of the St. Johns." I downloaded this excellent album based on the blog and it is awesome! I am very happy to own it.